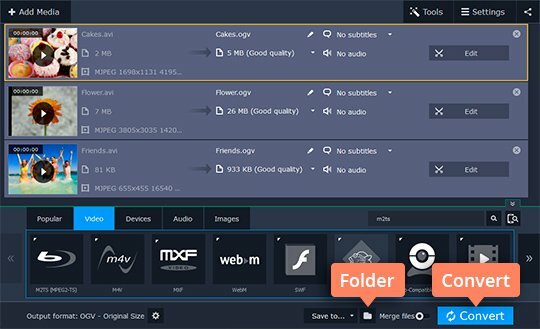 Need a quick and easy-to-use OGV file converter? Along with WebM and MP4, OGV is a video format that’s widely used for embedding video in a web page. You can easily play this type of video file on your PC or Mac using almost any media player, but most mobile devices don’t support this format. So if you want to play an OGV video on your phone, tablet or portable media player, you need to convert it to an appropriate format. 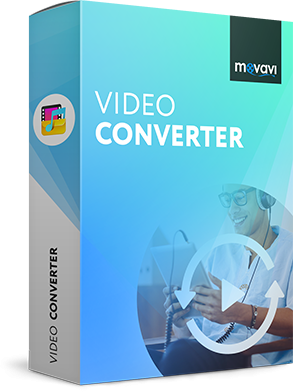 Try Movavi Video Converter – a powerful tool that will help you quickly convert your video to OGV and vice versa. The program supports more than 180 popular formats including AVI, MP4, MOV, MKV, WebM, and many others. 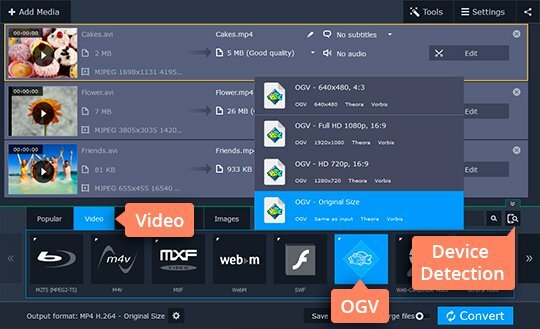 To learn how to convert videos to and from OGV, just download the appropriate version for your computer and follow the simple instructions below. Open the downloaded file and follow the on-screen instructions to complete the setup process. Click the Add Media button, then Add Video in the upper left corner of the program window. Select one or more videos for conversion. If you want to convert your video to a specific format (for example, convert MP4 to OGV), open the Video tab at the bottom of the converter interface and select the format you need. If you want to convert the video for viewing on a specific mobile device, click the Devices tab and choose the appropriate preset. You can also connect your device to the system and detect the right preset automatically by clicking the Cell Phone icon. The converted files are saved to the Movavi Library folder by default. You can keep this setting or choose a new output folder. To do this, click the Folder icon and specify the destination for the converted video. When you've chosen the desired folder, click Convert to start processing your video. The converted file will be ready in a few minutes. 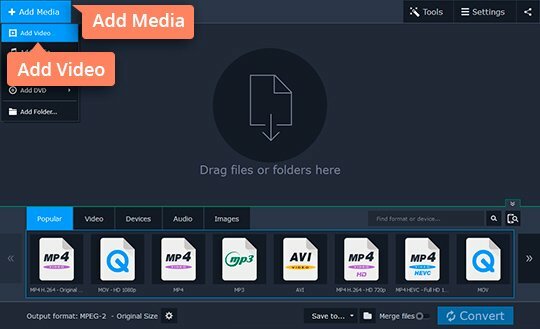 Movavi Video Converter can also help you create amazing animated GIFs from video fragments and extract music from movies by converting video files to MP3, FLAC, AAC, etc.